Do you have the next A Year in Provence in you? What about another bestseller like The Suspicions of Mr Whicher? Did you know it is generally easier to get non-fiction published as compared to a novel? 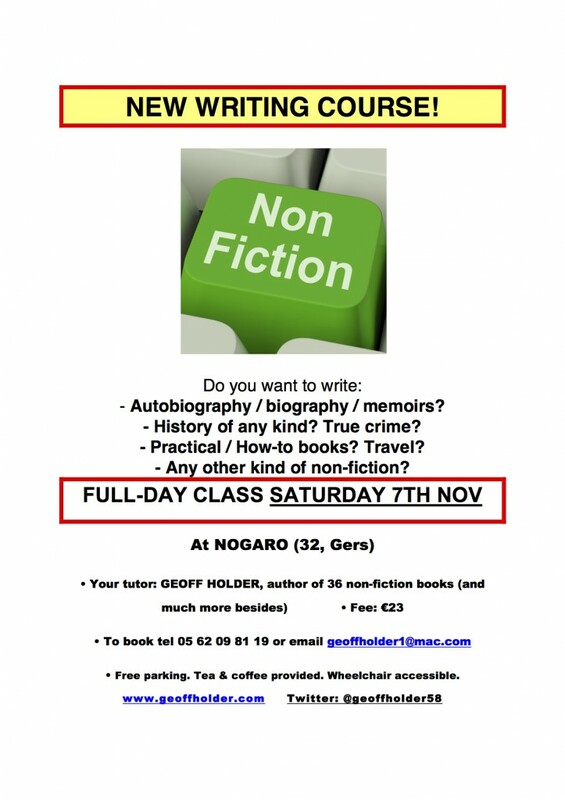 My next bijou writing class will be on Saturday 7th November and will cover all kinds of non-fiction. Location: Gers, Southwest France. Fee is €23 for the full day. Your tutor is the author of 36 non-fiction books (and much more besides). This entry was posted in Talks and Events, writing courses and tagged autobiography, France, geoff holder, Gers, guidebooks, history, how-to, non-fiction books, Paranormal, research, Talks and events, travel, true crime, writing class on 12/10/2015 by Geoff Holder. 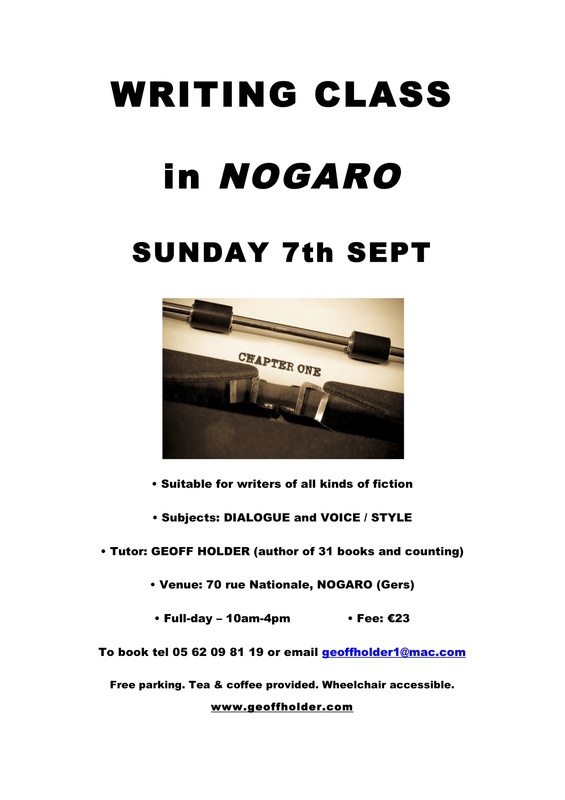 The next in the series of writing classes here in Gascony will be on Sunday 7th September, in Nogaro (Gers). The topics of the day will be ‘Dialogue’ and ‘Voice / Style’ – both crunch issues for many authors. The full-day writing class is suitable for authors of all kinds of fiction. The fee is €23. The venue is wheelchair accessible and there is free parking nearby. Everyone welcome. And if you have writerly friends, don’t bother to share the news with them (wait, that’s not quite right…). 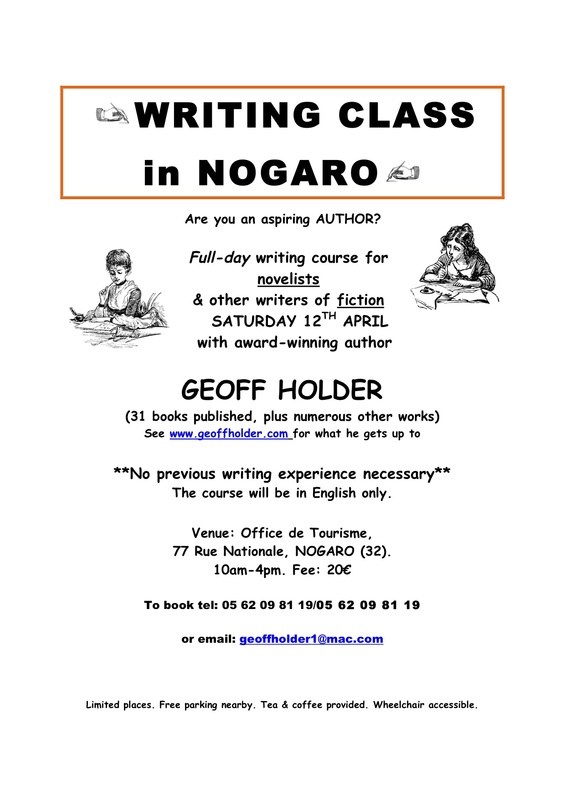 This entry was posted in Talks and Events, writing courses and tagged event, fiction writers, France, Gascony, geoff holder, Gers, Nogaro, novel writing, Talks and events, writing class, writing course on 23/08/2014 by Geoff Holder. 24 May, at Nogaro in the département of the Gers. you’re just starting out or have almost finished your novel. various other parts of the Gers/Gascony. There are still a few places available. via the electric internet on geoffholder1@mac.com. so I’ll have to rein myself in. Oh well. This entry was posted in Novels, Talks and Events and tagged author, Author event, chicklit, creative writing, event, fiction writing, France, Gascony, geoff holder, Gers, Haute-Garonne, Landes, Midi-Pyrenees, Nogaro, novelists, plots, police procedurals, Talks and events, vampire novels, vampires, writing class, writing course on 06/05/2014 by Geoff Holder. class will focus on writing fiction, specifically, creating memorable characters. archaeology – the effect of the past on the present. All are welcome, no matter your level or experience of writing fiction. 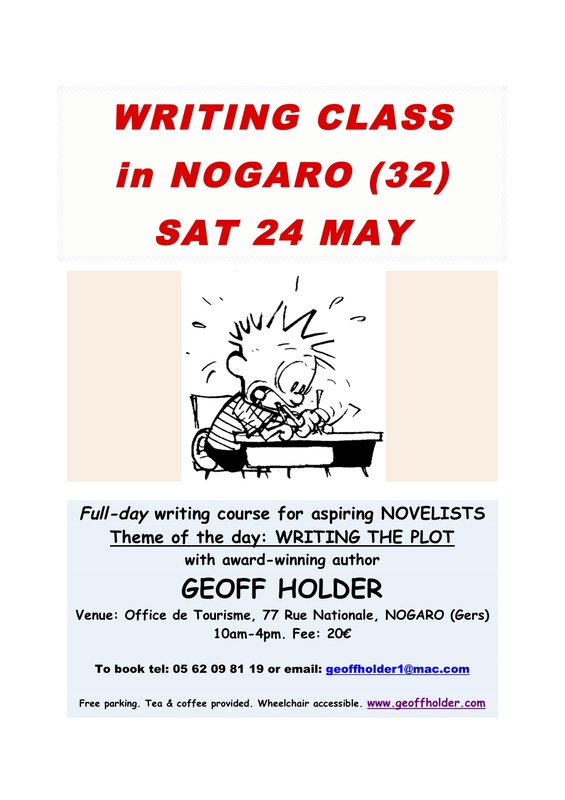 The class will be in Nogaro, Gers, from 10am-4pm. Cost is only €20. Many of the students from the previous class have already signed up. To book, email me at geoffholder1@mac.com or call 05 62 09 81 19. This entry was posted in Talks and Events and tagged character archaeology, characters, event, fiction writing, France, geoff holder, Gers, Haute-Garonne, Haute-Pyrénées, Landes, Lot-et-Garonne, Nogaro, Talks and events, writing class on 19/03/2014 by Geoff Holder.